You see these everywhere when you go shopping. The mall, the department store, pretty much everywhere you can look at the ceiling and see these. Bet you didn't think they weren't real! 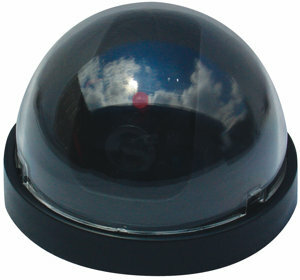 This fake dome camera looks just like the real thing. It is made from a real housing but without the electronics inside. This model features a flashing LED and metal mounting bracket. Installs easily using stainless steel screws. The flashing LED blinks continuously so anyone noticing it will believe that they are being watched and that it is recording them. If you don't want to use the blinking light, simply remove the batteries. These fake security cams are similar to those you see in department and grocery stores…no one will ever know the difference! Before you look into spending hundreds of dollars on a high-tech, difficult to install surveillance system, try this one out…it may just be all you need. Think they may be goofing off? Your employees and customers will never know that this isn't real…a great deterrent for employee and customer theft that is well within a conservative budget...so grab a few! Making it look even more real, this unit contains a flashing red LED light which draws extra attention, particularly at night. This faux camera looks just like the real thing, but costs a lot less! You can give the appearance that you're keeping an eye on what is going on in your office or store. If you don't want a flashing light, then you can take the battery out or just not install one at all. It only takes minutes to mount - just insert two AA alkaline batteries (not included), mount it to the ceiling using the included metal mounting bracket, and that's it! - Base measures 3 7/8" across and the dome is 2 3/4" high. - Operates on 2 "AA" batteries (not included). When you visit someone's home or business and you see surveillance cameras, you may decide to make a silly face or even do a little dance. But one thing you do not do is break the law. When criminals see a dome with the little red light blinking, they will usually abandon their thoughts of criminal activities and head somewhere else. The power of surveillance to deter crime is a significant part of your home security system. But did you know that when you see one at a home or business, you could be looking at a faux one? Fake ones are just as effective as real ones at persuading criminals out of whatever plans they may have. The original concept behind surveillance was to use videotape to catch criminals in action. Some people thought about hiding the cameras so the criminals could not see them and disable them. But then the idea of having a whole army of them started to catch on as a more effective alternative. The idea is that criminals who think they would have to spend hours disabling a system would rather just leave the site. A criminal always figures that where there are one or two, there is bound to be more. It only takes one to get a picture of their face and send them off to prison for a very long time. The idea of using dummy cameras caught on quickly, especially back when real ones were extremely expensive. Have a blinking red light and it could deter crime. The idea has caught on with residential homeowners that want to protect their houses but do not want to get too invested in the technology needed to do it. You can have a few inside your home that actually work and some fake ones outside. That should be enough to keep away even the most experienced criminal. Even if the criminal thinks some of them are fake, he doesn't know which ones are and he is destined to get caught. 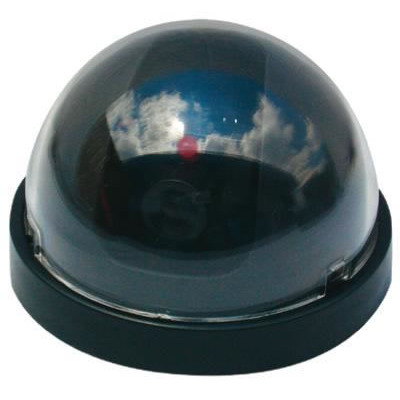 Fake dome cameras are a great idea for people who want the added feeling of security that a surveillance system gives without the added expense. You can still protect your home, but you can do so at a fraction of the cost. I just installed two of these at my weekend cabin. While they LOOK the part, the flashing LED only works with direct light and at that only within a few feet via motion. I tested in my garage before installing. Insert batteries, wave hand, LED blinks. Turn out light, wave hand again, nothing. AT the cabin you have to wave a broom at it to get it to flash. But, after install they look very real from standing under them.